1 Millionth BMW 3 Series Sedan Produced At BMW South Africa’s Plant Rosslyn! 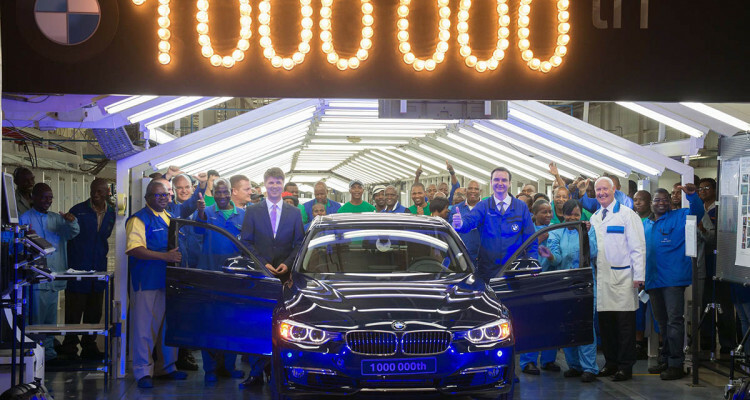 The one-millionth vehicle, a BMW 3 Series Sedan, rolled off the assembly line at BMW’s South African manufacturing plant in Rosslyn, Pretoria. The production anniversary was celebrated during a visit by member of the Management Board of BMW Group responsible for production, Harald Krüger. BMW cars made in South Africa are also successful on the international stage. Since its inception, and before the establishment of a dedicated international automobile industry, BMW South Africa has exported cars. In 2014, BMW 3 Series Sedan exports from Plant Rosslyn increased by over 17% which clearly solidified BMW South Africa’s position as the country’s leading exporter of premium vehicles. BMW South Africa directly and indirectly employs over 43,000 people: more than 3,700 associates at the plant and at the national sales organisation, as well as over 3,700 dealership staff and some 36,000 first-tier supplier employees. In 2014, over 2,900 workers at the Rosslyn plant built 68,771 BMW 3 Series Sedans for the local and export markets.